I felt there weren't enough games with zombies in them so I made a Wolfenstein 3D level that only uses zombies. I'm actually quite proud of this one. I think the design is quite good and there is a little story going on but it may be hard to tell. There is a very elaborate secret area. There are multiple difficulty levels, so try the first one if it's proving to be too hard. Shoot white and black enemies! IF YOU WIN THE GAME,YOU'LL GET TO SEE DINOSAURS. YAY! This is the sad tale of how the Dermonts, after twenty plus years of fruitful life and contributions to society, were torn apart after a vicious struggle with the undead. The four family members huddle together, aiming outward. Use the keyboard to control them. They can't change their facing direction, so losing one family member is quite costly. This is the sad tale of the last hours of the Wilframs. In this game you control all four of them at once. They cannot move from their positions, but unlike other families they can aim in every direction. Use the mouse to direct where they should shoot. Simple survival game. Mouse only. Two nights ago, I had a dream about going on holiday with my family. At the end of the week, they all packed their bags and left, while I arrogantly sat in the empty cottage surrounded by dirty clothes and books and stuff. I thought I would have plenty of time to pack my stuff up, but little did I know that the owner of the cottage had arranged for a horde of zombies to swarm in at 7pm and devour anyone who hadn't left yet! I guess this was to discourage lazy bums like me from hanging around after check-out time. The remainder of the dream involved picking up all my junk from around the cottage and its garden, while evading or fighting off zombies. This is the game of that dream, created in Game Maker 7. Your goal is to pick up your five remaining t-shirts and stuff them into the bag before the zombies get you. There is no sound because I wasted far too much time drawing zombies. The game maker file for the game is included in the zip, in case anyone is interested in checking it out for some reason. I've been playing a lot of Wario Ware DIY lately. It only lets you use one 'button', to tap your DS screen with the stylus or click a cursor using the Wii remote. 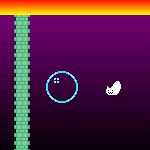 A lot of the games introduce more complicate controls by throwing in a load of virtual buttons, so you can tell your character to move and jump and things. Personally, I find this very irritating! So I made a game about it. The objective of this game is to fight off an endless tide of zombies. You can only attack by playing an utterly unneccessary minigame on the bottom half of the game screen. Click on the roaming bugs to make the karateman punch; punch zombies to stay alive. What could be simpler? !